On 8th August this year, I posted on a fascinating article that had just appeared in Science in which the crystal structure was reported of two small molecules, 1,3-dimethyl cyclobutadiene and carbon dioxide, entrapped together inside a calixarene cavity. Other journals (e.g. Nature Chemistry ran the article as a research highlight (where the purpose is not a critical analysis but more of an alerting service). A colleague, David Scheschkewitz, pointed me to the article. We both independently analyzed different aspects, and first David, and then I then submitted separate articles for publication describing what we had found. Science today published both David’s thoughts and also those of another independent group, Igor Alabugin and colleagues. The original authors have in turn responded . My own article on the topic will appear very shortly. You can see quite a hornet’s nest has been stirred up! At issue is whether the two bonds (indicated with arrows below) are best described as normally covalent, or very much weaker van der Waals contacts, or essentially non-interacting atoms. The last two interpretations would sustain the claim that 1,3-dimethyl cyclobutadiene and carbon dioxide can co-exist as separate species inside the cavity. The first would argue that they have reacted to form a different molecule. You can inspect the 3D coordinates by clicking on the diagram below. Barboiu et al originally argued that these two bonds were strong van der Waals contacts, with C-C and C-O distances of 1.5 and 1.6Å respectively, and with a OCO angle of 120°. The various responses to this claim tend to the view that these distances/angles clearly represent new covalent (or partially ionic-covalent) bonds, and that the combined species cannot be described as 1,3-dimethyl cyclobutadiene and carbon dioxide. There is obviously much more to it than that (including a detailed analysis of the errors present in a partially disordered crystal structure). So make your own minds up based on the articles cited above and if it helps, the original 3D coordinates, for your convenience made available above! This entry was posted on Friday, November 19th, 2010 at 7:49 am and is filed under Interesting chemistry. You can follow any responses to this entry through the RSS 2.0 feed. You can leave a response, or trackback from your own site. Thanks, Henry, for this excellent contribution to the debate. For completeness I might add that Barboiu et al. maintain their original claim. In their reply they predominantly defend the quality of their X-ray data and change their interpretation infinitesimally. Needless to say that I have my own opinion on the quality of their reply, which I will however not disseminate here. What I will say is that even if the quality of their structure determination were of the highest order, their interpretation of C-O and C-C distances between 1.4 and 1.6 Å as weak interactions rather than covalent bonds is pretty unconventional to put it mildly. To add to David’s comments, another unconventional aspect is the implication that bending carbon dioxide from linearity to 120° can arise from a weak interaction. It takes more than 70 kcal/mol to impose this bend upon isolated carbon dioxide, and there is no reason to suppose it would be enormously lower in a cavity. Of course, if the CO2 reacts to form sp2 hybridized carbon, that is not merely a different matter, but a different resulting molecule. I touched upon that topic in this post. Thank you for your insightful analysis. Indeed, the 1.50 Å C2–C3 van der Waals contact between Me2CBDS and CO2 is shorter than the 1.56 Å C–C bond in “Me2CBD” and the high energy cost for the CO2 bending (to the perfect trigonal angle of 119.9 degrees!) is well beyond of what true “van der Waals” interactions can account for. However, an equally significant fact is that the bicyclic lactone is transparent in the 320- to 500-nm excitation range employed by the authors. O. Chapman reported that the β-lactone intermediate is unreactive under these conditions (O. L. Chapman, C. L. McIntosh, J. Pacansky. J. Am. Chem. Soc. 95, 614 (1973)). Its fragmentation to CO2 and CBD only occurs with photons of much higher energy (<290 nm). 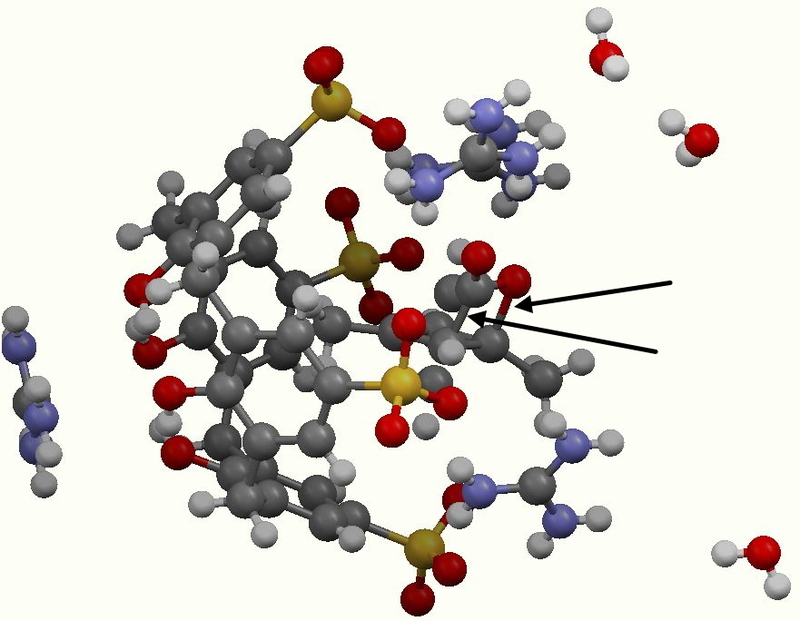 If Barboiu et al describe their experiment correctly, this experiment never had a chance to produce cyclobutadiene! Thanks Igor for that insight! One might argue that inside the calixarene (this does comprise four ion pairs, and hence the electric fields i.e. quadrupole and octupole, must be very high) might have an effect on the bicyclic lactone. It makes me wonder whether a TD-DFT calculation on the entire system might be worth attempting, together with a comparison with the isolated lactone. Do you happen to know if anyone has studied the effect on electronic excitations of encapsulation, or would such effects be expected to be minimal? I have calculated the TD-DFT electronic spectrum for the bicyclic lactone at the wB97XD/6-311G(d,p) level, using the geometry predicted for it as encapsulated in the calixarene cavity. One calculation is for the gas phase, the other with an applied continuum solvent water field. The former shows the first significant absorption at ~230nm, the second shows this decreasing slightly to ~225nm. This accords with Igor’s suggestion that the compound is transparent at 320-500nm, and provides a hint that the environment it finds itself in may not influence this greatly. A TD-DFT spectrum of the complete host-guest system would nevertheless be desirable. For completeness, I also include a CASSCF(6,8)/cc-pVTZ calculation of adiabatic bending of carbon dioxide. This calculation is archived at 10042/to-5180. I think that your TD-DFT calculations provide a very strong indication that the photochemical part of experiment is flawed! I do agree, however, that the crystal environment should influence the absorption spectrum. A priori, there are two ways how one can shift absorption to the red: destabilize the ground state or stabilize the excited state. In this particular system, the first component is unlikely to be important because the supramolecular system has been designed to incorporate the guest via attractive stabilizing interactions and thus, the ground state should be, in fact, stabilized via inclusion into the host. Selective stabilization of the excited state is not impossible but it needs to be dramatic to move the absorption from 230nm to 320 nm! While the ring CC lengths reported by Barboiu, et al. for the two putative Me2CBD forms are rather close to these computations, this can only be a fortuity as the claimed equilbrium, as well as the “square planar” geometry, seem totally implausible. My own lower level computations confirm expectations that the methyl groups have only minor effects. Below is the TD-DFT UV-visible spectrum calculated for the full system, including the calixarene host, and the Dewar lactone as guest (and applying a continuum solvent field for water to model the extended environment). Again, we see the system is largely transparent above ~270 nm. As an addendum to this comment, I am uploading the scaleable SVG format UV and ECD spectra. These allow the image to be rescaled without loss of resolution. From a photophysical perspective, your finding of the lowest energy excitation being located at calixarene suggests that the host can quench photochemical reactions of the bicyclic lactone guest via energy transfer. This would certainly make the report of cyclobutadiene formation in this system even less plausible! David Bradley, Two bond or not two bond? The two systems certainly differ, the most obvious being the O=C=O asymmetric stretch! An caveat is that the model is for one unit of calixarene + guest, and not for an extended lattice. Postscript: you can view the coordinates for the claimed 1,3-dimethylcyclobutadiene in the cavity at DOI: 10.5517/CCTNX3G and 10.5517/CCTNX5J. Can a cyclobutadiene and carbon dioxide co-exist in a calixarene cavity? is licensed by Henry Rzepa under a Creative Commons Attribution-Noncommercial-Share Alike 3.0 United States License.